Yesterday was my 50th birthday! I worked from home during the day, and in the evening I went out with some friends and I had a nice steak for dinner. Some friends wanted to buy me drinks, but I had to turn them down since I had to work the next day. Turning down an offer for a free drink is sort of frowned upon here, but work is more important. The other day I remembered that I had spent my 40th birthday in China. I had come to China with a group of about 20 people for vacation and some kungfu/taichi training. The day of my birthday we were in a little hotel in a town called Dengfeng, which is right outside the Shaolin temple in Henan province. The people in the restaurant at the hotel brought me a birthday cake during dinner, but they didn't have any forks so we used chopsticks to eat the cake. My 30th birthday was in Oakton, Virginia. One of my neighbors was also having his birthday at about the same time, and we had a big cookout/party with about 40 or 50 people. I'm not sure where I was on my 20th birthday. I might have been at the JFK Special Warfare Center at Fort Bragg, or was that in 1982? I forget. I have no idea about my 10th birthday... that was too long ago for me to remember. Where will I be on my 60th birthday? I have no idea. Chengdu is the capital of the Sichuan Province, and Sichuan means "four rivers", since it has four major rivers that run through it. 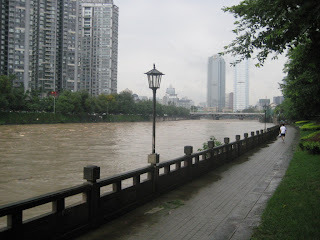 Since we have so many rivers in Sichuan there is usually a lot of flooding, but in Chengdu there is usually not any flooding. On Sunday though we had a lot of rain, and there was some flash flooding around the city. Where I live it was not too bad, since we live very close to a river and a lot of the rain drained down to the river quickly. The rivers in the city have high walls built into the banks, and I've never seen them come close to overflowing. This picture was taken last August and shows the river in front of my apartment, and this was the highest I had ever seen the river get. On Sunday it was about this high. In some parts of the city though they had up to 30 inches of water. A lot of roads became impassable, and even one subway station got flooded. I also heard that a lot of cars, bikes, scooters, and motorcycles were completely submerged in some underground parking areas. You can see some pictures of some of the flooding in Chengdu here. Some friends of mine recently had a baby, and Sunday I was invited to a party for his 100th day birthday. This is pretty popular here since only a few decades ago the infant mortality rate was much worse than it is now. If an infant lived to 100 days then it was usually a good sign. Anyways, I went out to find a taxi, which are hard to find even when it is not raining, and after waiting for an hour and not finding a taxi I gave up. I was soaken wet, so I went back to my apartment and dried off, fixed myself some dinner, and watched an old episode of Poirot. It turns out that there were about 100 people invited to the party, and only about 60 could make it on Sunday. There was another party held on Monday for the 40 or so of us who could not make it on Sunday. I'm not sure what the name of the restaurant was, but it was somewhere in the western part of the city. The food was very good, and I ate too much. As the only foreigner at the party a lot of people came up to greet me, make sure my wine glass was never empty, and made sure that I was given a cigarette as soon as I extinguished the previous one. I think I was smoking through almost the entire meal. One of those strange but happy events in Chengdu. "I should, indeed, with peculiar delight, have met and exchanged there congratulations personally with the small band, the remnant of that host of worthies, who joined with us on that day, in the bold and doubtful election we were to make for our country, between submission or the sword; and to have enjoyed with them the consolatory fact, that our fellow citizens, after half a century of experience and prosperity, continue to approve the choice we made. May it be to the world, what I believe it will be, (to some parts sooner, to others later, but finally to all, the signal of arousing men to burst the chains under which monkish ignorance and superstition had persuaded them to bind themselves, and to assume the blessings and security of self-government. That form which we have substituted, restores the free right to the unbounded exercise of reason and freedom of opinion. All eyes are opened, or opening, to the rights of man. The general spread of the light of science has already laid open to every view the palpable truth, that the mass of mankind has not been born with saddles on their backs, nor a favored few booted and spurred, ready to ride them legitimately, by the grace of God. These are grounds of hope for others. For ourselves, let the annual return of this day forever refresh our recollections of these rights, and an undiminished devotion to them."